Aliyun, Alibaba Group's cloud-computing arm, is enabling the movie-making business with a new service aimed at giving Chinese production houses a faster, cheaper way to create computer-generated special effects, computer-animated movies and 3D films. The service, named Rendering Cloud, lets filmmakers tap into Aliyun’s extensive cloud computing resources to “render” digital special effects and animations. Rendering is the use of computers to add layers of realistic lighting, shading, reflections, shadows and other visual effects to video and graphics. The rendering process, crucial in computer graphics development, requires powerful hardware and sophisticated software. Aliyun has teamed up with Shenzhen-based Rayvision, a provider of cloud computing and rendering services to the global entertainment industry, to offer the new service—which according to the companies will be based on the largest cloud-based rendering platform in China. At a press conference held today in Hangzhou, China, officials for Aliyun and Rayvision said Rendering Cloud customers for some projects will be able to reduce the cost of rendering by 40 percent and cut rendering time from months to less than a week. That’s largely because of the computational power fielded by Aliyun, which operates the I.T. infrastructure that powers Alibaba’s vast e-commerce network. Aliyun’s distributed-computing system has more than 100,000 processor cores. In contrast, Disney’s recent animated film Big Hero 6 was rendered on a supercomputer with 55,000 cores. Making this power available via the cloud could give even small studios lacking the financial resources to acquire sophisticated technology the ability to make high-definition blockbusters, according to Aliyun. 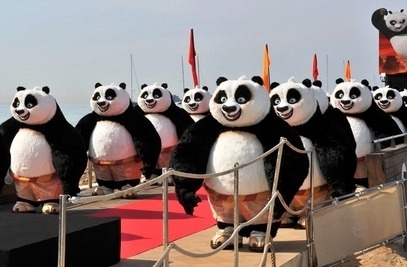 “By providing computing capacity, we hope to help Chinese filmmakers produce Hollywood hits like Kung Fu Panda,” said Simon Hu, president of Aliyun. In addition to closing the gap between Chinese and Western studios in terms of technical capabilities, Aliyun also aims to reach a worldwide market of some 10 million 3D graphics artists. “We hope to integrate cloud computing with the film and animation industry, and serve global studios, enabling small studios worldwide to produce high-definition blockbusters with great visual effects,” Hu said at the press conference. Rayvision has worked with more than 10,000 studios in 41 countries and holds more than 70 percent share of China’s film-rendering market, according to the company. Rayvision has participated in projects such as Mr. Hublot, a 3D animated video that won Best Animated Short Film at last year’s Academy Awards. Under the partnership with Rayvision, Aliyun is providing filmmakers with cloud storage and other services. A cloud computing lab also will be established to develop cutting-edge film technology in partnership with industry players, the companies said. Alibaba Pictures, Alibaba Group’s flagship entertainment company, uses big data technology in film production, distribution and marketing. While not directly involved in the Rendering Cloud partnership, Alibaba Pictures intends to use the platform in its film projects and could become a strategic partner with Aliyun and Rayvision, Zhang said.